When Virginia Davis was in the eighth grade she participated in her first science fair. Davis did not know at the time the impact it would have on her later in life, but because others showed her the value of outreach activities when she was a student, she learned that science could be fun and that she had the potential to be an engineer. In addition to her research, Davis dedicates her life to inspiring students to become scientists and engineers. Davis is an Alumni Professor in the Department of Chemical Engineering at Auburn University. She joined the faculty in 2005 and since then has made a difference in outreach on campus through various programs and initiatives including BEST Robotics, Women in Engineering Camps and Youth Experiences in Science to name a few. "I want all students, from little kids through high school seniors, to be able to see themselves as future engineers," said Davis. "For me, it's important to 'pay it forward' because I wouldn't be here if it weren't for all the time others put into outreach when I was in high school and middle school." Through her outreach, Davis teaches technical material in a way that is easy for students to understand. She feels that engaging students is a responsibility of professors. Davis focuses on showing students that engineering and science is fun, exciting and can change the world. "Being a professor is an ongoing process, and I try to really engage with my students," said Davis. "They have to be able to do the work, but I want to help them learn the best way that they can, reach their potential and whatever goals they have and really discover what it is that they want." Davis has made major contributions to Auburn University in her outreach work, "paying it forward" daily. She helped found Auburn's Society of Hispanic Professional Engineers student chapter, an organization devoted to advancing Hispanics in science, technology, engineering and math. "Hispanics are going to be more than half the U.S. population within the next few years," said Davis, "but very few Hispanic students are able to see themselves as future scientists and engineers." The Society of Hispanic Professional Engineers offers professional and developmental experience, internship and job opportunities, scholarship and outreach to its members. Davis wants Auburn students to be able to take advantage of the opportunities the national organization provides. Just as she inspires her students, Davis' grandfather inspired her to become an engineer. He left his home in Cuba to come to the U.S. so he could pursue a degree in civil engineering. He graduated with his engineering degree from the University of North Carolina. Davis grew up around Hispanic scientists and engineers. Her uncle is her inspiration for outreach. "My uncle is a geologist," said Davis. "He still, in his 80s, does outreach with kids once or twice a week." Earlier this month, Davis was recognized for her commitment to outreach by receiving the Auburn University Award for Excellence in Faculty Outreach. "I think the faculty award recognition is really terrific and I'm honored to be given this award," said Davis. "Being a faculty member is a very multifaceted, non-stop job and it's good to be recognized." 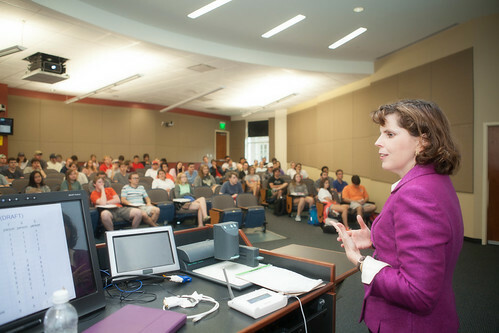 Davis has received several other prestigious awards from Auburn University and other organizations throughout her career. 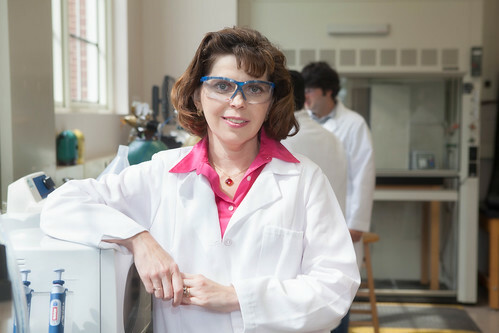 Virginia Davis, a professor of the Department of Chemical Engineering, was recognized with the Auburn University Award for Excellence in Faculty Outreach at the annual Faculty Awards Ceremony Feb. 2. 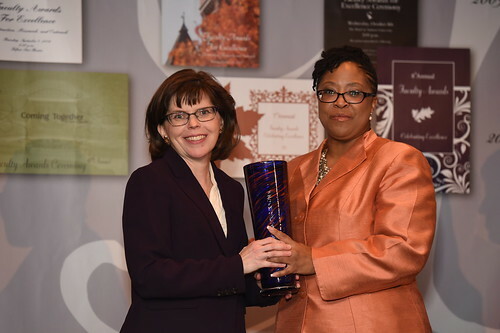 Chippewa Thomas, right, Director of Faculty Engagement for University Outreach, presents Virginia Davis with the Auburn University Award for Excellence in Faculty Outreach at the annual Faculty Awards Ceremony Feb. 2. Davis is an alumni professor in the Department of Chemical Engineering.